The Armstrong headjoint offers players crisp response and ease of playing throughout all registers. The offset G key follows the natural contour of student's hands and makes playing more comfortable. Armstrong's signature CNC key cups ensure that pads will seat perfectly flat which prevents air leaks. 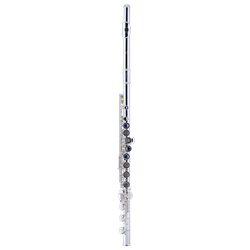 Built in Elkhart, Indiana, the Armstrong 104 flute is designed to last and provide a superb playing experience for students. Silver plated headjoint and body, bottom-adjusting silver plated mechanism, closed hole Y-arm keys, offset G, C foot, molded plastic case. FREE SHIPPING with your purchase today!